All about Patterns. Designing Patterns. Selling Patterns. Create Your Own Pattern. Inspiration for those that love to Craft -- FREE! I have become "hooked" by all this talk of Needle Punch. After reading the article that Kelle wrote awhile ago....I knew that I wanted to add it to the blog and learn more about it. I have been seeing it in different magazines and more and more folks are trying it as their craft. I have been looking into getting my supplies. I live in Canada and not everyone will ship items up here so I have to look around. For patterns.....that part was super simple....PATTERNMART of course! Have you tried this yet? How long did it take you? I am thinking I am going to become hooked quite quickly and will be finding it hard to want to do anything else for awhile! LOL I already have an array of ideas racing thru my mind on how I can incorporate needle punch into what I already create. Come on....... lets join the fun and get "punching"
Bio:Kelle Arvay is a doll pattern designer and long time artist. She also is the owner of http://www.patternmart.com/ which has thousands of craft patterns that can be downloaded instantly. In addition, she is also the co-publisher of Creative Times magazine, http://www.ctmagazine.net/ which is a bi-monthly downloadable magazine full of crafting articles, trends, interviews and several free patterns in each issue. If you love the look of Primitives and would love to add more pieces to your home, consider creating your own or visiting local flea markets for that next treasure. When we first moved to our home years ago money was rather tight with the reality of a higher mortgage and just the general cost of living. Our home was built in 1916 and really has a wonderful charm to it unlike some of the brand new homes being built today. We knew when we saw this home that it was meant to be adorned with Primitives. Not having a lot of money to spare back then we started to decorate our home by picking up pieces at flea markets, estate sales and auctions. Most of them needed a coat of paint and a lot of sanding to create a worn look. The great thing about finding pieces at these type of venues is the low cost. I recall picking up a three shelf standing piece that had a drawer at the bottom. It was simply stained. I could see the potential to turn this piece into a more primitive looking piece. So with black and mustard colored paint in one hand and sandpaper in the other, I set out to turn back time on this charming piece. To start I sanded the wood to scruff it up so it would take the paint better. Next I painted it black as my base color.Next came a coat of mustard colored paint. Once it was completely dry I sanded the edges all over to give it a worn look. I sanded all the way down so the black paint showed through. Any piece you sand you'll want to consentrate on any knobs, handles and edges as those are the spots that wear first when it occurs naturally. Finally I applied some wax stain over the entire piece. You can also find some really neat architechtural pieces as well. One in peticular I recall finding and I love to this day is a large old round porch post. It is huge. Probably about 14 inches wide and 8 feet tall. I also found a large old wood birdhouse with a metal roof. The post and bird house were both painted white and the paint was peeling quite a lot on both. So they were both in what I would consider perfectly primitive condition. With my husband's help we mounted the birdhouse on top of the post and cemented it in the front yard. To this day we enjoy watching the birds making their nests in it every year. Old wooden doors make wonderful decorating pieces. Add a horizontal shelf across the door and put it in the corner of a room, outside on a porch or cut one in half and make a really neat corner shelf unit. The corner door shelves can hold your collection of make do's or smaller antiques. Old sleds make great pieces for your porch as well. During the holiday's add a sprig of firs to it. Other pieces you might come across is old early silverware. I love setting my porch table with old place settings. These ofcourse are just for looks but they are so charming. 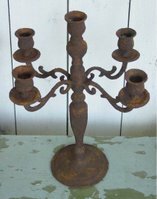 You can also find old rusty kitchen utensils, collandars, ladels, flour sifters and other kitchen items to use in your decor. Old rake heads make great places to hold your old rolling pins. Take several old metal rakes, the kind that curl a bit on the ends and cut them off to just the rake head. Mount them on your wall vertically and set your rolling pin on each rake. Have fun, be creative and befor you know it you'll have found that next wonderful treasure to decorate your home with. I took one of the courses offered on Patternmart. It was so simple to do.... just found which one I was interested in...clicked....took my class. 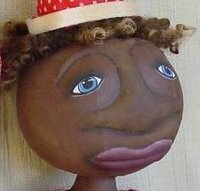 The price was perfect and I now have some great tips on how to help me create a round doll head. Its something I've been wanting to learn for quite awhile and now I have. What are you waiting for? Its so simple! If you sell e-patterns and mail them to customers, how much time collectively do you think you spend in a week e-mailing the files to them? How much time in a month? Sending a e-pattern via e-mail is not a hard task but it does take a few minutes to do. Those minutes add up. More so than that, how often are you checking your e-mail to see if you have a new e-pattern sale? That takes time as well. If your not automating, your wasting the one resource that is limited to you....YOUR TIME. By automating the process you not only satisfy the customers desire for instant gratification but you free yourself from constantly being in front of the computer. What could you be doing instead? Creating? Designing more patterns? Ofcourse! This is why I wanted to share with you the service of IPM Pro. IPM Pro, allows you to sell your e-patterns or any type of downloadable item in a instant fashion. No more e-mailing the file to customers, no more constantly checking your inbox. If your on vacation....NO WORRIES. Let IPM Pro handle those sales for you. What IPM Pro does is it allows you to create a automated e-pattern (or any file type) business. The customer purchases your pattern, pays for it and then downloads it instantly after payment. How cool is that!? I don't know about you, but my time is precious and I will NEVER go back to solely e-mailing e-patterns. Ofcourse on occasion I do for customers that purchase them via email orders, etc., but on a whole IPM Pro has saved me a bunch of much needed extra time. Check it out for yourself. The value of this type of service is fantastic and you can automate your e-pattern business starting at a low $5 a month. 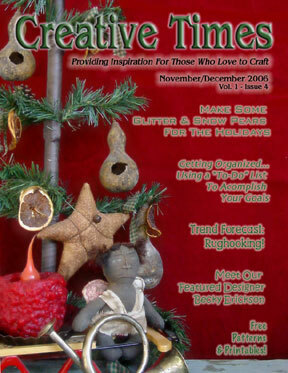 Have you grabbed your FREE issue of Creative Times Magazine yet? * Several FREE Printable Patterns! Discover the new Self-Study classes over on Pattern Mart. With these classes you can learn how to sew Round Doll heads with 3-D features, learn how to texture grunge items for that super primitive effect or even learn how to paint delightful designs. You will learn to create these wonderful doll heads and features with this Self-Study course. Class includes step by step photos and instruction. Work at your own pace to learn the skills to create delightful doll heads with characture. 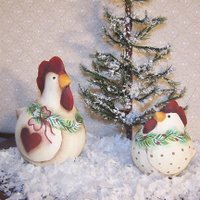 In this class you will hear and see how to float/shade, drybrush, and whateverelse you need to know to paint and create these cute chickens. You will have 30 days to take the class at your leisure. Learn how to turn any ordinary item into a extreme grungy Primitive masterpiece! Let me share with you how you can change items made of metal, cloth or even plastic into ultra texture grunged creations! Great class for beginners. You will hear and see how to float/shade, drybrush, and all else you need to know to paint and create these cute cats. You have 30 days to take the class at your leisure. So come join the fun and learn a new crafting skill!